A common problem risk analysts face is how to distribute the Monte Carlo results of their models, particularly if the person receiving the results does not have a copy of your modeling software. 1. The recipient purchases a copy of the ModelRisk Results Viewer from https://shop.vosesoftware.com/. 2. 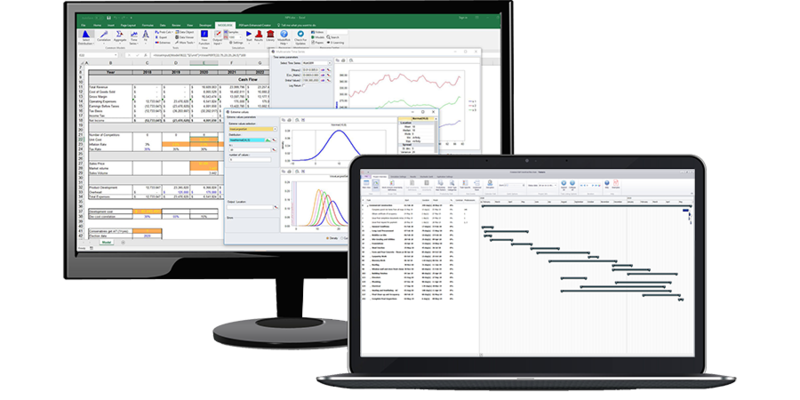 Once your simulation run is complete, produce the graphs and tables you want in as many tabs as you need in the ModelRisk Simulation Results window. 3. Click the Save button and give a name for the results file. A file will be created with ModelRisk’s .vmrs extension. 5. Double-clicking the file will automatically open the ModelRisk Results Viewer. All the graphs that you created, including formatting, are preserved. 6. The recipient can interrogate the plots, add/remove variables, change formatting, add/remove markers, create new plots – essentially everything that you can do in ModelRisk, and then save all these changes in new file if desired. What the recipient cannot do, of course, is change the actual underlying simulation data.